AdvancedFlightSim (AFS) welcomes you to FAA approved, full motion flight simulator training at a fraction of the cost of actual airplane operation or rental. We feature the RedBird FMX 1000, a FAA certified Advanced Aviation Training Device (AATD) with an electric motion platform, a fully enclosed cockpit and instructor operating station. The 200 degrees of wraparound visuals include every airport in the United States. In addition to the normal cloud and visibility control, the advanced visuals allow for weather changes that also include wind, turbulence, day/night, rain and snow conditions that can be introduced to the flight. The RedBird FMX represents state of the art simulation technology. 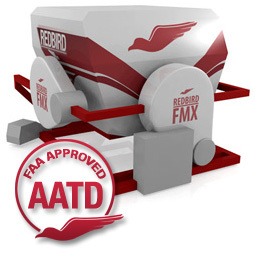 The RedBird FMX simulator can be configured in both single and multi-engine models. We currently offer 3 configurations, a Beechcraft Duchess, with the standard "six pack" panel with a Garmin 530/430, a Cessna 172 and a Beechcraft Baron 58 G Baron with a Garmin G1000 configuration. When training is conducted by a certified flight instructor, all time in the RedBird FMX simulator is fully FAA logable. In fact, flight training completed in the RedBird simulator can be applied towards your Private (2.5 hrs. ), Commercial (50 hrs. ), Instrument (20 hrs. ), and ATP (25 hrs.) certificates. With the Beechcraft Baron configuration the "high performance" endorsement can be accomplished by the instructor. Utilizing a flight simulator will save you both time and money. No long waits for your turn to take off or start the approach. You are always "number 1". 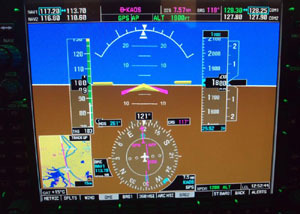 Fly to minimums on a ILS, practice circle to land procedures at night in light snow, or fly a VFR cross country. It is all up to you. Scheduling time in the sim is as easy as going online! Just click the SCHEDULE link at the top of the page and instantly see all the available training slots. Once registered with AFS, you can reserve your simulator training with a simple click of the mouse. It's that easy! We are always flexible to meet your needs. Call, Stop By, or Contact Us any time. You can use one of our instructors or bring your own. It is your choice. AFS has contracted with local flight schools to utilize the FMX training device. The simulator rents for $75.00 per hour, Instructor fees are additional.